In the ongoing Team Anna-Congress theatrics, the day saw key Anna associate Arvind Kejriwal seeking some more time to respond to the I-T notice asking him to pay around Rs nine lakh in dues. The Comptroller and Auditor General (CAG) will be entrusted to audit funds spent on implementation of various rural development schemes sponsored by the Central government. 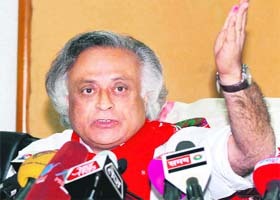 Union Minister for Rural Development Jairam Ramesh addresses a press conference in Guwahati on Thursday. At a time when the Right to Information Act is being actively debated and concerns voiced over public authorities’ resistance towards voluntary disclosure of information under the law, a curious case of CBSE’s refusal to part with AIEEE (All-India Engineering Entrance Exam)-related data has come to light. Around 15 persons commit suicide in the country every hour with majority of them (69.2 per cent) being married persons, according a government report released today. One out of every five suicide victims is a housewife. The increasing Chinese assertiveness in the South China Sea and the possibility of a nuclear deal between India and Japan are expected to figure prominently during talks External Affairs Minister S M Krishna will have with his Japanese interlocutors during his three-day visit to Tokyo beginning tomorrow. Alarmed by the recent spate of encephalitis deaths in Uttar Pradesh and the rising incidence of Acute Encephalitis Syndrome (AES) across other states, the Health Ministry today called for constitution of a Group of Ministers on the issue. The West Bengal government today gave a clean chit to B C Roy Children's Hospital after 12 infants died since Tuesday, holding there was no medical negligence or any lapse on the part of hospital authorities. Seven persons were injured in two successive bomb blasts in Thangal market complex here, police said today. While the first bomb exploded near the Indian Overseas Bank branch at about 9 pm, the second one took place in Milan Enterprises area about ten minutes later yesterday. 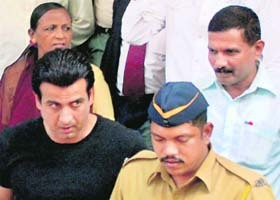 Prominent television actor Ronit Roy was today arrested after he crashed his Mercedes into another car injuring its passengers. He was later released on bail. This Diwali, the Central Pollution Control Board (CPCB) registered a “slight reduction” in air pollution across North India. While the air pollution level declined as compared to last year, the noise level rose marginally due to bursting of more loud crackers. The Medical Council of India has spent over Rs 31 crore during the last five years on travel expenses of its members for attending meetings, visits and inspection tours, with nearly one-third of it spent during last fiscal. The CBI has not found anything so far to corroborate that former telecom minister A Raja's aide Sadiq Batcha, who was found hanging in his Chennai residence, could have been murdered nearly a month after the DMK leader's arrest in 2G case. One of the key witnesses in the case against suspended IPS officer Sanjiv Bhatt, who has been accused of forcing a constable to sign a false affidavit, has been missing since Tuesday, police said today. “I am consulting my friends and will take a decision in a week or 10 days. They have given me very little time,” Kejriwal said, all the while maintaining that he had done “no wrong” and he and his colleagues were being “targeted”. Incidentally, I-T’s first notice to Kejriwal, asking him to pay Rs 9.27 lakh by claiming that he had violated bond clauses under which he went on a study leave for two years, was issued in the first week of August. Meanwhile, carrying forward his attack on the RSS and Team Anna, Digvijay declared Sri Sri Ravi Shankar a BJP-RSS agent, an accusation that prompted the spiritual guru to invite the senior Congress leader to his Art of Living course to achieve a better quality life. “People write a lot of things about everyone. 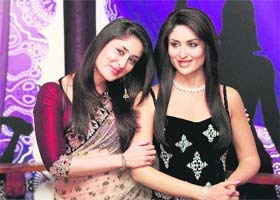 I cannot respond to all of them,” agencies quoted Sri Sri Ravi Shankar as saying. “I will continue to work against corruption. I am not afraid of anyone,” he added. Saying that Sri Sri Ravi Shankar was the “Plan C” of the BJP-RSS combine meant to divert public attention away from its “terror links”, Digvijay explained that yoga guru Baba Ramdev and Anna Hazare were the other “plans” of the BJP and its fountainhead RSS while warning that the spiritual guru should be “wary of Sangh and BJP”. Singh said he had attended Sri Sri Ravi Shankar’s Art of Living Class in 2001. The BJP reacted to Singh’s onslaught, saying the Congress leader was “completely decimating the Congress with his outspoken and almost shameless way”. “Singh may make any plan he likes, he will only destroy the reputation of Congress,” BJP leader Ravi Shankar Prasad said. However, every passing day is bringing fresh troubles for Team Anna to tackle. The team’s core committee will meet this weekend to discuss controversies surrounding the group, including those pertaining to continuance of Prashant Bhushan in the team and alleged financial malfeasance of Arvind Kejriwal and Kiran Bedi. Even though Kejriwal maintains he has done no wrong, I-T officials say they can initiate property attachment proceedings under service rules and subsequently, initiate criminal case against a person who defaults on dues. The I-T had, on August 5, issued a notice to Kejriwal, asking him to pay Rs 9.27 lakh, claiming he had violated bond clauses under which he went on a study leave for two years. He was asked to deposit the money. A fresh notice was issued to him a week ago. It asked him to pay by October 27 the dues accumulated following the alleged violation of bond clauses under which Kejriwal, an IRS officer, had gone abroad on study leave for two years between November 2000 and 2002. Kejriwal attacked issuance of the notice, terming it as an action of the government’s “dirty tricks department” under instructions from political bosses. He claimed he did not “violate” any bond provisions and resigned from the job after the stipulated three years of rejoining duty following his study leave. Anna Hazare said on Thursday he will extend his vow of silence as verbal communication with people is leaving him “very weak”. CAG will appoint special Accountant Generals (AGs) in various parts of the country to take care of auditing of funds provided by the Central government for rural development schemes in various states. “My philosophy is be liberal in funding, but be ruthless in ensuring accountability and transparency regarding expenditure. We are putting a system in place to achieve it,” Ramesh said. CAG will also carry out performance audit of implementation NREGA scheme in eleven states of the country, including Bihar, Orissa, UP, Rajasthan, Andhra Pradesh, for the last two financial years. The last performance audit of NREGA implementation was carried out in 2006-07. While stating that the pace of implementation NREGA needed be accelerated in Assam, Ramesh admitted and the major impediment in implementing NREGA was not duplication, but inordinate delay in payments to beneficiaries through their accounts in post offices and banks. The beneficiaries should be paid within 15 days of completion of work, but in many states it takes around six months. Ramesh, however, asserted that NREGA had very positive economic and social impact by increasing agricultural wage in the country given that agriculture wage is key to uplift rural economy. The minister informed that the National Rural Livelihood Mission had set an objective to make at least one woman from every rural BPL family a member of a Self-help Group (SHG). The focus would be on five tribal-dominated states of Bihar, Orissa, Jharkhand, Chattishgarh and Assam. Interestingly, the board had no objections last year when the same RTI applicant (as the one in the instant case) had requested it for answer keys of the all-India PMT 2010. The information was supplied promptly. But when it came to disclosing the same information - answer keys - of AIEEE 2010, the board started behaving secretively. This, notwithstanding recent directions of the Supreme Court that instructed “all examining bodies to permit examinees to have inspection of their answer books.” The CBSE conveniently excused itself from the law of the land and continues to decline AIEEE 2010 answer keys on grounds that “larger public interest doesn’t warrant disclosure of such information”. It may be noted that disclosure of answer scripts of multiple choice questions (as mandated by the apex court) is of no value unless answer keys are also disclosed along with. In the AIEEE 2010 case, the board has been refusing information from the word go. The case file, which last came up for hearing this September 30 before the CIC, reveals that at one point the CBSE asked the applicant to shell out Rs 10 lakh for the supply of answer keys and marks data of the students who took AIEEE 2010, the largest entrance test held in India. The RTI Act on the other hand prescribes only Rs 50 fee when the information is sought in an electronic format on a CD (as in this case). In yet another plea to refuse the information sought, the CBSE said before the CIC that it had destroyed the answer keys in question. When asked to say the same thing on oath in the affidavit, the board didn’t come forward. “If answer keys have been destroyed as per the schedule for retention and preservation of documents, the CBSE’s Central Public Information Officer should file an affidavit,” the CIC ordered. During the course of the appeals before the Central Pubic Information Officer and later the CIC, the board cited a third plea to deny information to the applicant, a professor at IIT-Kharagpur. The CBSE said the information sought (answer keys) was exempt under Clause 8(1)(j) of the Act that debarred public authorities from sharing data that would entail disclosure of identity of others and thereby violate the privacy norm. The CIC, however, noted on September 30 that the applicant was not interested in names or roll numbers of candidates. “The CBSE is directed to provide the information after withholding roll numbers etc,” Deepak Sandhu, Central Information Commissioner ruled, rejecting CBSE’s claim for Rs 10 lakh for giving details. For the record, the instant RTI request was filed on June 15 last, a few days after the AIEEE was held. As a policy, no institution - be it the IITs, state boards or the CBSE, can destroy question papers or answer keys that fast. Unlike answer-scripts that can still be disposed of immediately, answer keys and question papers are required to be preserved for sufficiently longer periods. The CBSE’s refusal in the instant case only validates the concern the PM had recently voiced at the CIC’s annual RTI convention where he said the public authorities had a long way to go for making voluntary disclosure of information under Section 4 of the RTI Act. If the public authorities disclose on their websites what they can under the Act, the rush of RTI applications would be automatically curtailed, NAC member Aruna Roy says. “It is observed that social and economic causes drive most males to commit suicide, whereas most of the female victims are driven by emotional and personal causes,” the report, released by Home Minister P Chidambaram, said. Of these persons, 41.1 per cent happened to be self-employed while only 7.5 per were unemployed. More than one lakh persons (1,34,599) in the country committed suicide during 2010. Around 70.5 per cent of these persons were married males, while 67 per cent were married females, according to the report of the National Crime Record Bureau. Kerala, Tamil Nadu, Karnataka, Maharashtra and Andhra Pradesh accounted for 65.8 per cent of suicides in the age group of 60 years and above. The figures for suicides because of “family problems” and “illness” stood at 23.7 per cent and 21.0 per cent, respectively. The percentage of suicides due to “property dispute” and “death of dear person” showed an increase of 48 per cent and 28.9 per cent, respectively. The overall male:female ratio of suicide victims for the year 2009 was 65:35. However, the proportion of boys:girls suicide victims (up to 14 years of age) was 52:48. Around 26.3 per cent of the total suicide victims happened to be educated up to primary level, 22.7 per cent up to middle school level, while 19.8 per cent were illiterate. Around 1.4 per cent of the suicide victims were government servants. Of the total number of suicide cases reported in the country, the state-wise break-up stood as: West Bengal (11.9 per cent), Andhra Pradesh (11.8 per cent), Tamil Nadu (12.3 per cent), Maharashtra (11.8 per cent) and Karnataka (9.4 per cent). West Bengal, which stands at number 2 in the present report, had reported the highest number of suicides in 2008 and 2009. Southern states Andhra Pradesh, Karnataka, Kerala and Tamil Nadu and Maharashtra have accounted for 51.7 per cent of total suicides reported in the country. Sikkim and Puducherry reported 45.9 and 45.5, respectively, suicide deaths per one lakh of population as against the national average of 11.4. 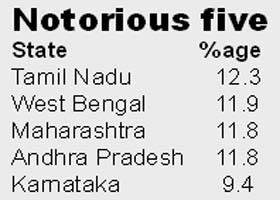 More than 55.9 per cent child victims belonged to Madhya Pradesh, Andhra Pradesh, West Bengal, Karnataka and Tamil Nadu. Sikkim reported the highest rate of suicide (45.9) followed by Puducherry (45.5), Andaman and Nicober Islands (36.1), Kerala (24.6) and Chhattisgarh (26.6). Tamil Nadu reported a significant increase in number of suicides (16,561) in 2010 over 2009 (14,424) (an increase of 14.8 per cent) followed by Maharashtra (from 14,300 in 2009 to 15,916 in 2010), the report said. Krishna will co-chair the fifth India-Japan strategic dialogue with his Japanese counterpart Koichiro Gemba to review all aspects of the bilateral, strategic and global partnership and discuss regional and international issues of mutual interest, External Affairs Ministry officials said. The two sides are also expected to finalise the dates for Japanese Prime Minister Yoshihiko Noda’s visit to India in December for the annual summit with Prime Minister Manmohan Singh. The officials said Beijing’s claim of full sovereignty over the South China Sea is bound to figure in the talks with both countries being the neighbours of China, enjoying far from normal relationship with it. Like India, Japan too has been worried over the growing maritime and military ambitions of China in the South China Sea and in the Far East. The situation for Tokyo is all the more serious since China has also laid claims on the disputed islands near Japan in the South China Sea. China has already indicated to New Delhi its opposition to the agreement India signed with Vietnam recently for oil exploration in the South China Sea. Krishna is likely to inquire from his Japanese interlocutors the fate of the proposed civil nuclear deal between India and Japan. The two countries started discussing the nuclear deal in June last year and have held three rounds of discussions on it so far. However, further discussions on it were put on the backburner after the nuclear disaster at Fukushima in Japan in March. Also there remain many differences between Japan and India on the nuclear issue. Japan continues to insist that India sign the NPT and the CTBT whereas India has no intention of doing so given its long-standing concerns regarding the discriminatory nature of these treaties. A nuclear deal with Japan is crucial for New Delhi as many US and French companies wishing to partner India in the nuclear sector use critical components made by Japanese companies. New Delhi is also expected to make a renewed pitch for seeking Tokyo’s support for its membership of top multilateral nuclear regimes like the Nuclear Suppliers Group, the Australia Group and the Wassenaar Arrangement. The two countries will also consider ways to deepen their cooperation in combating piracy that can affect their maritime trade and security. Significantly, the India-Japan strategic dialogue takes place barely weeks before the East Asia Summit in Indonesia that will focus on evolving an inclusive regional architecture in which both countries have high stakes. The Prime Minister will head the Indian delegation to the East Asia Summit. Tokyo is likely to reiterate its commitment to the multibillion dollar Delhi-Mumbai Industrial Corridor and may announce that its official development assistance to New Delhi will remain on course despite the devastating tsunami that hit Japan earlier this year. The minister said the proportion of AES cases had increased in UP alone from 64 per cent to over 90 per cent from 2005 to 2011. The rise has been found out by scientists of National Institute of Virology (NIV), Pune working in Gorakhpur. Much of the AES incidence has been attributed to entero-viruses which are transmitted through contaminated water. In seven districts of eastern UP, problem of contamination of water with human faeces is particularly serious as many areas are low-lying and amenable to water-logging as well as flooding over extended periods, causing contamination of shallow layers of underground water. Locals there use shallow hand pumps for drinking water and consumption of such water leads to infection with entero-viruses, mostly in children. The logic behind a GoM is simple - There is no vaccine or specific drug against non-JE AES cases. It is estimated that about 25 to 30 per cent of infected children die and among those who survive, about 50 per cent suffer from physical and mental impairment. The minister said the situation was alarming in these areas and AES was now spreading to Assam and Bihar. “Considering the complex nature of the problem, we suggest a multi-pronged strategy encompassing prevention (sanitation, availability of safe drinking water and improvement in nutrition), case management (capacity-building of medical and paramedical staff, referral transport) and rehabilitation (rehabilitation of disabled children and setting up of schools for physically and mentally challenged children) measures,” Azad wrote to the PM. So far as Japanese Encephalitis (JE) goes, it is a viral disease transmitted through mosquitoes and was first reported in UP in 1978. The worst AES outbreak in UP occurred in 2005 when 6,061 cases and 1,500 deaths in children aged 1 to 15 years were reported mainly from Eastern UP districts of Gorakhpur, Kushinagar, Deoria, Maharajganj, Basti, Sant Kabir Nagar and Siddharth Nagar. The government introduced JE vaccine in 2006 in these districts and in 2010, 7 most endemic districts were again covered under the vaccination drive. JE vaccination has since been incorporated in routine immunisation and these measures have led to a substantial decrease in morbidity and mortality. This year, UP reported 2,792 AES cases and 424 AES deaths till October 19. JE positivity in AES cases has declined from 36 per cent in 2005 to less than 7 per cent in 2001. But JE is only one of the viruses in the complex causation of AES. The government came to this conclusion after the state's largest referral hospital for children inquired into the crib deaths and submitted a report to it. "After considering the report submitted to us, we don't find any lapse or medical negligence on part of the hospital authorities," Director of Medical Education Sushanta Banerjee said. Hospital Superintendent Dilip Pal told PTI that one more baby died today in the hospital taking death toll to 12. "On an average five infant deaths occur out of the 300 admissions daily," Pal said, adding "This is not abnormal as most of the referred cases are extremely critical and brought in a moribund state." Pal said the babies in critical condition were brought for admission at the very last stage. "This poses a serious problems for us to deal with." Maintaining that the best of care and medical attention was given to the patients, he said the referral hospital, eastern region's largest paediatric one, was burdened with a high rate of admission mostly referred from district hospitals. Asked about the progress of the inquiry ordered by Chief Minister Mamata Banerjee into the death of 18 infants in June, Pal said an inquiry committee had been formed and a report was being sent to the health department. The injured have been identified as Md Faruk Khan (23), Manish Sakwat (15), Manisha (12), Md Mukta (16), Ms Sultanath (20), Nitish Agarwal (30) and Kusum Agarwal (26). The injured were taken to nearby hospitals where their condition was stated to be out of danger. No individual or group has claimed responsibility for the blasts. A Manipur Rifles jawan was among two persons injured when militants attacked the house of a government official, officials said today. Militants hurled a grenade at the house of chief engineer of public works department Lokendra Singh at Kiyamgei area in Imphal East district at around 10.30 pm last night. In the explosion, a jawan of the 7th Manipur Rifles battalion and a driver of the official were injured, they said adding the injured were taken to a nearby hospital where their condition was stated to be out of danger. Prominent television actor Ronit Roy was today arrested after he crashed his Mercedes into another car injuring its passengers. He was later released on bail. According to the police, Roy was driving home in his Mercedes after a Diwali party when he crashed his vehicle into a car vehicle in suburban Mumbai at around 5.45 this morning. Four members of a family in the second vehicle received injuries. Their names have been given as Deepak Darera (60), his wife Kanta (56), and daughters Sneha (29) and Pooja (24). Kanta received severe injuries and was rushed to hospital while the other occupants in the car did not require hospitalisation, police said. The actor himself rushed all the victims to hospital. Roy did not test positive for alcohol, the police said. However, his blood sample has been taken for testing. He was produced before the Bandra Metropolitan magistrate court, which set bail at Rs 12,000. Roy has featured in a number of successful television serials like ‘Kyunkii Saas Bhi Kabhi Bahu Thi’, ‘Bandini’ and ‘Adaalat’. The significant improvement in air quality just one day post-Diwali, a finding suggests, is not due to any proactive measures by the authorities or more people taking a “green” pledge this time, though that may have also contributed to this very positive development. It was the timing and weather conditions prevailing around the festival of lights that helped in faster dispersion of pollutants, resulting in clearer air in a far shorter timeframe this year. According to CPCB member secretary JS Kamyotra, favourable winds across the plains helped in dispersing suspended air particles faster and bringing down the air pollution level even though the level of pollution and noise had shot up on Thursday due to excessive use of fireworks. The CPCB is monitoring online ambient air and noise pollution data from more than 30 cities across the country. 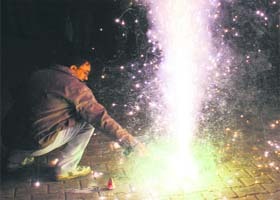 “Air pollution load from crackers was lesser this year owing to favourable wind conditions,” Kamyotra said, explaining that the timing of the festival, late October this year, also helped in dispersing the pollutants faster. Apart from causing noise pollution, fireworks release toxins and harmful compounds like sulphur dioxide, carbon dioxide, carbon monoxide, manganese and cadmium in the air, can have an adverse impact on the lungs and can cause respiratory ailments. While in coastal areas, impurities in the air disperse faster, in other areas across plains, pollutants usually take three to four days to clear up. High temperature and low humidity with strong winds supported the dispersal. In an RTI reply, the medical education regulator said during 2010-11, Rs 10.95 crore were spent towards travel expenses while Rs 6.90 crore were spent in 2009-10, Rs 5.48 crore in 2008-09, Rs 4.11 crore in 2007-08 and Rs 3.66 crore in 2006-07. In addition to a number of other duties, the regulator also carries out inspection of all medical institutes in the country and only after its sanction, any institute offering medical courses can function. The agency has used the services of forensic experts from the premier All India Institute of Medical Sciences to detect if Batcha was killed but even after detailed examination, sleuths have not found anything which can substantiate the murder hypothesis, agency sources said. The CBI has, for crosschecking, roped in a team of doctors from AIIMS to examine the viscera and post mortem details of Batcha to rule out any "foul play" in his death. They said although the agency has not given up on the murder theory, its focus is now on the possible suicide as all pointers and evidence indicate in that direction. The agency had also examined the suicide note and came to the conclusion that it was in Batcha’s own handwriting. Also, there were no signs that he was forced to write it, according to a forensic report. The witness Sharanik Shah, who lives in Chandkheda area here is missing since 12 noon on October 25 as per his family, which initially believed that he had gone to Mahudi in Gandhinagar district for some ritual that was to be performed during Diwali. However, since Shah did not return till last night, a missing person's complaint was registered by his family and further investigation in the matter is on, police said. According to the FIR of constable K D Pant, based on which Bhatt was arrested, Shah had come with Pant to Bhatt's residence on the night of June 16. Shah was also present when Bhatt allegedly threatened Pant and made him sign affidavit that supported his claim that he was present in the meeting of February 27, 2002 called by Chief Minister Narendra Modi after the post-Godhra riots, the FIR said. As a witness in the FIR against Bhatt, Shah's statement has been recorded before a judicial magistrate by the investigating officer in the case.